Is Turkey Using Infrastructure Projects to Stifle European Criticism? FILE - Yavuz Sultan Selim bridge covered by fog over the Bosphorus, Istanbul, April 27, 2017. When the first jet airplane lands Monday at Istanbul's newest airport, it will mark a milestone in what analysts see as a Turkish drive to accomplish with contracting dollars what it has not been able to achieve with traditional diplomacy. Long frustrated in its bid to join the European Union, analysts say President Recep Tayyip Erdogan has increasingly stressed trade and investment initiatives during his travels to European capitals, making his country second only to China in large-scale construction projects while muting the criticisms of Turkey's human rights record that have blocked accession to the E.U. Istanbul's third airport, when it officially opens in late October, will be able to handle up to 200 million passengers a year, outstripping most other global transport hubs and establishing Turkey as a crucial gateway linking Europe and Asia. European investment has been key to many of Turkey's mega-projects, such as the airport and a multi-billion-dollar wind turbine farm announced this week, and Erdogan is aggressively looking for more. "Our bilateral trade volume with Italy amounted to nearly $20 billion last year," he declared ahead of a scheduled visit to meet the pope at the Vatican earlier this month. "However, our potential is much higher than that. We aim to increase our bilateral trade volume to $30 billion in 2020." Italian companies have benefited from a number of Turkey's initiatives, winning several lucrative defense and construction contracts including for one of the world's tallest and widest suspension spans, Istanbul's Yavuz Sultan Selim Bridge, which was completed in 2016. The deals have been a boon for European companies during a period of austerity across the continent. Analysts say this point has not been lost on Turkey and that it increasingly sees such partnerships as useful tools in its efforts to quiet criticism over human rights and its military incursion into neighboring Syria. "Ankara is buying anybody and everybody with these infrastructure projects and everybody is happy with it," said political scientist Cengiz Aktar. FILE - Russian President Vladimir Putin and Gazprom Chief Executive Alexei Miller inspect the work on the Turkish Stream gas pipeline project aboard the Pioneering Spirit pipeline-laying ship in the Black Sea near Anapa, Russia, June 23, 2017. "The Europeans get what they really want; they want to continue trade with Turkey," he said. "And to get the juicy infrastructural projects — they are very happy with this. This is why they keep appeasing Turkey. And all these laments about what is happening to the rule of law in Turkey, this is just crocodile tears." Competition for those contracts in Europe is fierce, according to analysts. "These mega projects, construction infrastructure, tunnels etc., are incredibly lucrative," said political analyst Atilla Yesilada of Global Source Partners. "The loans taken out by the building consortium are given treasury guarantees," he said. "The cost is lower than a typical market loan. There is a revenue guarantee in dollar terms, so whether the project is profitable, does not make a difference - the government makes up the difference. It's like a treasure room, there is no way you can lose money on these." Separately, Britain and Turkey have struck up a deep trade relationship, largely based on weapons sales, with Britain's BAE developing a military stealth jet for the Turkish armed forces. At the same time, London has voiced little criticism of Turkey over that country's human rights record or military operations in Syria. On Wednesday, the deputy chair of Turkey's ruling AK Party, Mehdi Eker, spoke at a meeting in the British parliament and voiced appreciation for Britain's stance on Turkey's ongoing military offensive in Syria against a Kurdish militia. Ankara has already coined the phrase "new realism" to define its diplomatic strategy with European countries. Analysts suggest Turkish foreign policy is increasingly sidelining its relations with the European Union and instead focusing on bilateral relations with individual European countries, shaped by pragmatism. "Relations seem to be based on the idea, 'let's put our problems aside, not dwell on them, agree to disagree or whatever,'" said political columnist Semih Idiz of the Al Monitor website. "But there are practical issues that have to be addressed." "For all the bad vibes at the moment, there are construction and strategic arms deals being signed between Turkey and France and Italy," he said. 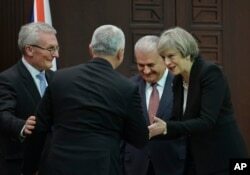 "And after, the post-Brexit situation will undoubtedly speed up Turkish-British relations, not only because Turkey needs good allies in Europe, but because Britain needs the alternative markets and alternative partners." Idiz went on to say there are "a lot of areas for Turkish diplomacy to move in" as he referred Britain's pending exit from the European Union. Critics are increasingly citing the adage, "He who pays the piper calls the tune," in describing Europe's relations with Turkey. They say as long as Ankara has the money to dish out lucrative and seemingly endless contracts to European companies, then its "new realism" foreign policy with Europe seems set to continue.